MarkDownMom Daily Deal: 5.00 Ct Chateau Montreal Genuine Green Amethyst Earrings $16! Large gemstones, sterling silver, lever back earrings with a retail value of $100, only $16! Buy it for yourself like MarkdownMom did or as a present. Plus free shipping! It doesn’t get any better than this! Go to Netaya and use promo code: FALL16. 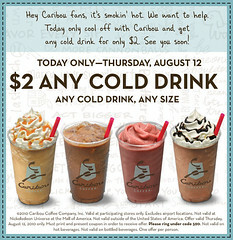 Get coffee designer beverages Today Only, August 12, 2010 from Caribou Coffee, and cool off deliciously! Ring under Code 590. Print this coupon to get the deal!